← Visiting an Auburn treasure. The story is important because it tells us that it often takes a lot of patience when working with living plants. Actually, her success is interesting because in the worst of conditions — poor sunlight, humidity and all the other things that Hawaii has that we do not have here in Auburn — Georgene did it in two years. In the Aloha State, where the conditions for pineapple are fantastic, it takes 18 months to mature a fruit. I went online with the Hawaii Department of Agriculture and they suggested the following, if you want to give it a try. Start with a very ripe pineapple and, rather than cutting the top off (it is called the crown), grasp it firmly and, while holding the bottom of the fruit, twist it off. Now, invert it and peel away, by pulling up six or eight of the bottom leaves. You will see several brown bumps; this is from where the roots will sprout. Next, you will need it to dry a bit. Just lay it on a table, out of the bright sunlight, for five or six days. This helps the crown to heal itself, and will help prevent rotting. From this point, there are two ways to proceed. You can set it in a pot of soil and keep it moist. Personally, I like this method. While most people would use potting soil, I like to mix my soil with half sand and half potting soil. It provides good drainage and lightens the mix and makes certain that your plants are not over-watered. Place the crown on the soil to the depth of the low leaves. You may have to prop it up if it keeps falling over. You will have a good root system developed in six to nine weeks. At that point, you can gently tug at the plant to see how the roots have developed. Now it is OK to start giving it six to eight hours of brighter light, and you can begin fertilizing it a bit, lightly at first. And, yes, you can move it out of doors during the summer. The plant will thank you for that. Be sure to move it back indoors before the first frost. You can also suspend the crown atop a Mason jar full of fresh water. I do not want foliage in the water. Now the tedious part. Change the water every two or three days. Chances are that the original leaves will wither and die. After week or two, you will see that the roots are beginning to emerge. When you have a good, strong root system, it is time to go back to the paragraph, “From this point,” to get it growing. 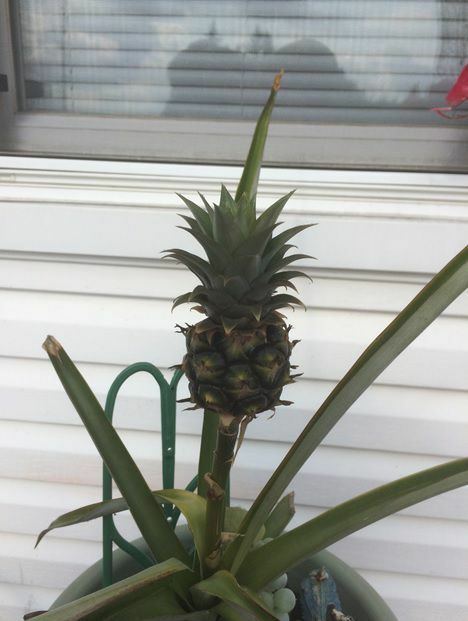 If you like pineapples and have them often, experiment! Try both methods to see which works best for you. I spent this past weekend in Niagara on the Lake and next week, I will describe one of the very best downtown plantings I have ever seen. This entry was posted in Garden, Plants and tagged Auburn NY, Cosentino Florist, Fruit, Garden. Bookmark the permalink.